After spending a few hours down on the dock it was time to come in and offload the morning's photos, grab a bite to eat and recharge the batteries - the camera batteries that is. I couldn't imagine being more "recharged" after a morning of enjoying the sounds of the river. 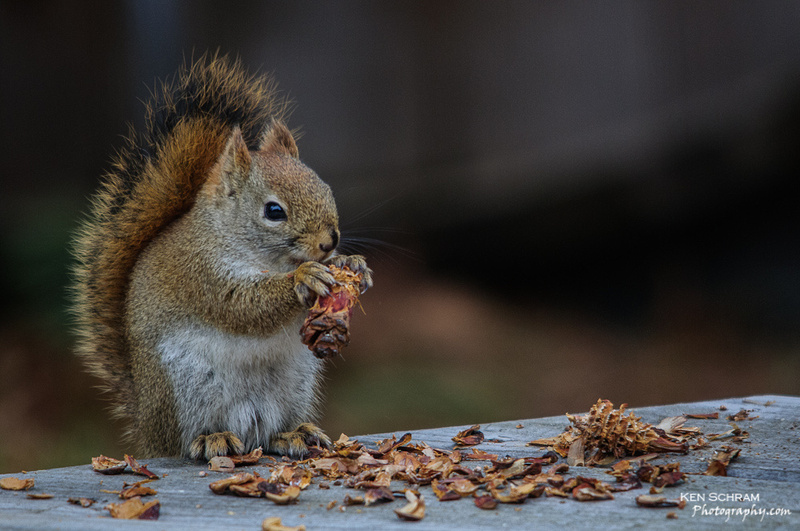 While copying images onto my laptop I happened to look out the back patio window where I noticed Mr. Red Squirrel enjoying his own lunch on the deck. He was gracious enough to pose for a few portraits while ripping through a one pine cone after another as if they were corn on the cob. Use the comments section below to offer up your best funny title to this cute little critter capture and remember to have fun.